Nobody wants a cookie-cutter wedding, so to give you a little inspiration on how to make your big day truly unique, we’ve put our heads together to bring you quirky, unusual and wonderful ways to really make your day a day to remember. You don’t see them so often these days, but the disposable camera is a great way to relive the special times. When you’re busy speaking to your guests, you may miss out on the hilarious or endearing activities that are happening across the room. Let your guests capture these memories for you on their own disposable cameras. At the end of the night, or after your honeymoon, you’ll have hundreds of prints to look through and stick into your photo albums. In the digital age, it’s lovely to have something tangible to hold onto from your special day. Get your guests involved in the evening reception by letting them mix their own drinks. Make things easy and affordable for yourself by choosing 4 or 5 cocktails that share common ingredients, such as the Martini and Cosmopolitan. Leave cocktail recipes on display for your guests, and let them mix and mingle to their heart’s content. At the same time as sending back their RSVP, ask your guests to send you a song request. This will save you creating your own playlist, will make your wedding more personal to your guests and will have them all up and dancing to their own songs. For a magical wedding reception, a tipi tent strewn with fairy lights will stun your guests. Add a live band, low seating and blankets if it’s likely to get chilly and you have all the ingredients for an entertaining night under the stars. Once the night is over, and your guests are ready to head home, they may be feeling a little peckish. Give your guests a midnight snack pack of goodies to eat on their journey home or when they arrive home. Nuts, sweets, wedding cake and a high end juice are just some of the things you can pop into a little gift box to hand to guests as they leave. You may have been to events where there is a video kiosk, and had a great time dressing up and leaving a video for the hosts. A video kiosk is a great alternative to the traditional guest book, and if you want to save yourself some money, you could even set up your own using an iPad and good quality microphone. If you are looking for an elegant and affordable way to dress your reception venue, hiring chair covers is the perfect option. We stock a wide range of chair covers and bows, designed to complement our linen range and create a truly magnificent look to your venue. 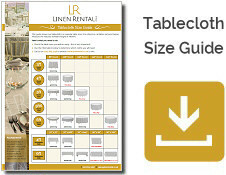 Take a closer look at Linen Rental today, and make your wedding day a truly unique event. We deliver all of your linens to you and pick them up once you are finished with them. No fuss, affordable prices and a wonderful way to dress your tables and chairs.